On Tuesday 4th of September, Bellona and Oslo Taxi teamed up for the 4th year in a row to showcase the progress of zero-emission taxis at Clean Vehicle Day in Oslo, this year also forming part of the annual European Mobility Week campaign. The event gathered speakers from industry, local authorities and civil society for a debate on policy measures needed towards the attainment of the city’s goal of an emissions free taxi fleet by 2022. On Tuesday 4th of September, Bellona and Oslo Taxi teamed up for the 4th year in a row to showcase the progress of zero-emission taxis at Clean Vehicle Day in Oslo, this year also forming part of the annual European Mobility Week campaign. 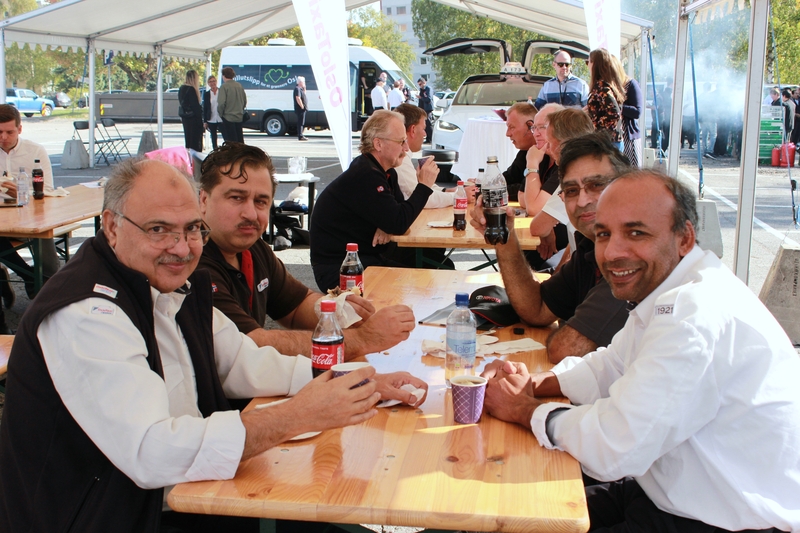 Taxi drivers were invited to find out more about the different zero-emission models available. The event gathered speakers from local authorities and civil society for a debate on policy measures needed towards the attainment of the city’s goal of an emissions free taxi fleet by 2022. EU legislation has a key role to play in ensuring similar objectives and efforts are observed across all European cities. The ongoing recast of the Clean Vehicles Directive offers a unique opportunity in this regard, but will policy makers grasp it? Opening the event, Bjørn Rebne, director at Oslo Taxi, Norway’s largest taxi company, reiterated Oslo Taxi’s commitment to transitioning towards clean vehicles, stating that environmental and climate considerations are an integral part of their business strategy. Mayor Marianne Borgen stated that 70% of Oslo’s citizens live in multi-tenant buildings and that schemes had been drawn up to speed up the installation of electric charging infrastructure. Next on the agenda was to build charging points dedicated to taxis. The Mayor, nonetheless, expressed concern that most of the city’s emissions come from transport and need to be addressed quickly. Heidi Sørensen, head of Oslo’s Climate Department, reiterated the role of taxis in the city’s public transport system, as well as the capital’s high climate ambitions. Indeed, by 2022 the target is to operate an entirely zero-emission taxi fleet. As such, dialogue between the city and the taxi operators was underway to determine which locations are most suitable for the placement of charging points so as to meet taxi driver needs. In addition to this, a new support scheme had been launched to provide financial support to taxi drivers to encourage them to install chargers in their homes. The private domain, be it in residential or commercial buildings, is indeed where roughly 90% of the electricity charged by an EV occurs, so securing adequate infrastructure coverage of these spaces will be key. Nonetheless, Sørensen also expressed a need to remain relatively technology-neutral, which was demonstrable by the requirement for every fuel station to provide at least one renewable fuel source of their choice. Next year, Oslo is the European Green Capital, and Sorensen claimed that visitors would be looking to travel on zero-emission taxis. She concluded by mentioning that new EV models are being developed with increasingly better range and cost-competitiveness. Finally, Christina Bu, Secretary General of the Norwegian EV Association highlighted two key elements as being critical to EV taxi drivers, namely the range and passenger space of the vehicles. Regarding technological developments, Bu commented that the fastest chargers were being installed, at 150 KWh, which was 3 times faster than conventional ‘fast chargers’ based on current EU standards. She also explained that new methods of charging were being introduced and were planned for 2020, such as inductive (wireless) charging. Inductive charging could play a significant role for taxi drivers, who could potentially charge while waiting at a taxi ramp. Nonetheless, the biggest challenge remained the slow supply of electric vehicles, resulting in long waiting lists for delivery. She therefore provided 2 pieces of advice to taxi drivers seeking to go electric. Firstly, to sign up to the waiting lists as soon as possible. Secondly, to invest in charging infrastructure at home with the new financial support scheme from the city of Oslo, since most of the charging would most likely be at home, complemented with fast charging during the work shift if necessary. Bellona’s Christina Ianssen subsequently conducted interviews with Oslo Taxi drivers who shared their experiences of driving electric. Arne Billkvam, who had recently switched to an EV, explained that his contract was specifically for transporting patients to and from the hospital. He was particularly surprised by how economical his car was, since he had little maintenance costs and no fuel or toll costs. Cost savings in the range of 100,000 NOK (equivalent to EUR 10,400) per year were quoted. However, the need to charge required forward planning, he often charges his EV during his lunch break, but sometimes there was a queue for the charging point, which could affect his availability. As a result, he had acquired a new EV with better range so as to limit his charging requirements. Nevertheless, he made the point that charging infrastructure reserved for taxi drivers was an absolute necessity. Both drivers and the public needed some more convincing, there was still plenty of scepticism, but customers were surprised that an EV could possibly be practical for a taxi driver. While Oslo debates measures to achieve the 2022 target for its taxi fleet, EU policy makers too face an opportunity to give a boost to cleaner taxis throughout the Union. The Clean Vehicles Directive, the EU’s main tool regulating public procurement of clean vehicles, is currently undergoing reform. A number of MEPs have tabled amendments in support of expanding its scope to cover taxi companies. Because of their longer average distances travelled, taxis need to be replaced more frequently (every 3-4 years) than regular passenger cars. This in turn presents an opportunity for timely introduction of zero emission solutions. Next month’s vote in the European Parliament’s Environment Committee will be a decisive step in this regard, and Bellona will be working hard to secure the taxi sector’s place in this piece of legislation.